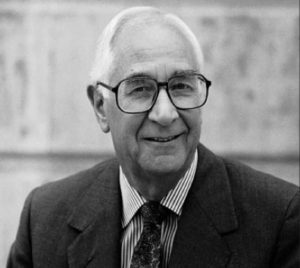 Perhaps most well known as CEO of Herman Miller, Inc., trustee of Fuller Theological Seminary, and author of multiple leadership books, Max De Pree's leadership was an art, 1924-2017. Every generation has its grouping of distinguished leaders that contributes to shaping their field of expertise. Max De Pree is one such leader. He is perhaps best known for his work as the CEO of Herman Miller, Inc. Herman Miller was founded by his father D. J. De Pree, who ran the company until the early 1960’s, when Max and his brother Hugh assumed responsibility for its leadership. During his tenure, Herman Miller became one of the most profitable Fortune 500 companies. From 1975 – 1986 it ranked seventh in terms of total return to investors. But what Max is perhaps most proud of was the manner in which his beliefs were incorporated into the organizational culture. They instituted the Scanlon Plan, a program that encouraged and rewarded employee participation. Building the business on a foundation of trust and integrity, Herman Miller worked with some of the design world’s greats, and earned the respect and admiration of such design icons as Ray & Charles Eames, and George Nelson. This goes a long way in explaining how a company in Zeeland, Michigan, was able to establish itself as a no-compromise, innovative design firm that produced beautiful modern furniture. The result of his body of work earned Max De Pree a place in Fortune magazine’s National Business Hall of Fame. What is perhaps less known about Max De Pree is the degree to which he was intentional about allowing his beliefs to shape his approach to life, management, and leadership. His books Leadership Is an Art, Leadership Jazz, Leading without Power, Called to Serve, and Dear Zoe demonstrate this. His understanding of leadership as art and/or jazz says much about his own aesthetic. He is readily forthcoming about his commitment to Christianity, and it is his theology, more than anything else, that shaped who he is and the way he lives. He understood that the private/public separation really did not reflect the person he wanted to be. He was the same man whether he was in board meetings, consulting or speaking one-on-one. A highly respected business leader, he is also a beloved father, husband, and grandfather. Max is a student of human nature and of life. His integrated vision of what it means to be human in the fullest sense is perhaps the result of his own pursuit of life. An important part of who we are and of our approach to problem solving incorporates Max De Pree’s concept that belief shapes practice. In other words, an organization’s identity, character, relationships, culture and systems, all of which affect its success and profitability, are directly influenced by beliefs, whether explicitly acknowledged or not.